We talk a lot about English cottage style homes here. What is an English cottage home? It's one that has a steeply pitched roof and cross-gables, a large chimney, small-paned casement windows, and arched (or half-round) doorways with ornate hardware and exterior lighting. Here you'll find lots of photos and examples of English cottage style exteriors & interiors featuring coffered ceilings, hardwood floors (often painted), and other English cottage style home accents. Looking for a great, classic choice for your kitchen backsplash? Subway tile could be what you’ve been looking for. It’s easy to clean, durable, inexpensive and beautiful. That adds up to a great value in the world of home building materials. 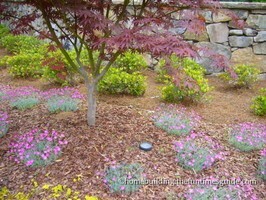 Don’t just pour a dull concrete driveway. Jazz it up with embedded washed river pebbles! You’ll be astounded with the results! Natural cork floor tiles are fast becoming the hottest trend in flooring options, especially with green homebuilders and their customers. Here is an example of one that has been installed. This is the final series of my photo posts of the English tudor-style cottage located in Marietta, GA. The home has an abundance of over-the-top quality features rarely seen in homebuilding today. 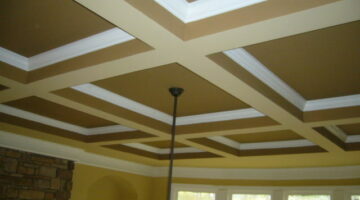 Considering Coffered Ceilings In Your Home? Here’s A Coffered Ceiling Photo Gallery Filled With Great Ideas! 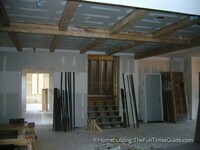 Thinking about having coffered ceilings built in your new home? Here are quite a few examples of different styles and/or adaptations to coffered ceiling styles. Pictures of a thoroughly detailed English cottage house made in the U.S.A. Most of these photos were taken of some of the window and door features of the home. Here are some of my best photos of a full-blown authentic English cottage that was built adjacent to Kennesaw Mountain National Battlefield Park in Marietta, Georgia. There’s way too much to describe in this little excerpt. 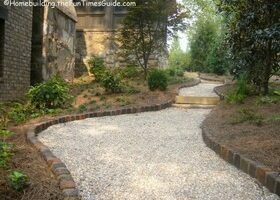 Mock rocks are an attractive, creative and cost-effective method of concealing undesirable exposed utilities around the landscape. 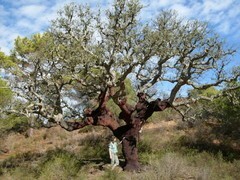 Here’s an example of one in use. 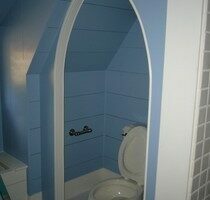 If you’ve ever thought to include a touch of gothic architectural style to your water closet than here is a great example. Rondel Glass Featured In Your Windows Will Make Guests Stop In Their Tracks…Guaranteed! A more in-depth post regarding the rondel glass discs that were featured in some of the windows of the recently finished English cottage-style home that I’ve been featuring. 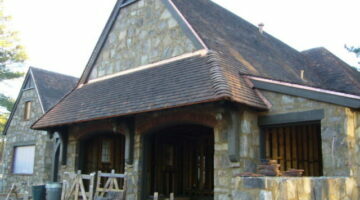 One of my final posts on this English cottage-style home in The Retreat at Kennesaw Mountain. Copper rain chains and rain cups have been around for centuries in Japan and now they are making their way to the states. Hard to believe something so simply beautiful and functional has taken this long to be used here in the good ol’ U.S. of A. If you want an alternative to the traditional enclosed metal downspout on your gutters then you might want to consider a rain chain. Who knows…you might even lower your blood pressure from the effects of watching rain pout through one in action. Masterfully installed hand-hewn white oak exposed beams utilizing old world-style mortise and tenon joinery is just one more reason to read on. You’ll have a hard time finding craftsmanship of this caliber in the homebuilding industry today. Seeing is believing! If you have an interest in past and present groin vault ceilings in architecture then have a read. The English cottage-style home I’m following also has an example of a groin vault ceiling in the vestibule. Reclaimed antique terracotta roof tiles from Europe are just one of the crown jewels of this English cottage-style home. Terra cotta roof tiles are in very high demand these days so it makes this roof that much more valuable. It is a sensible choice for a home such as this because it is architecturally in character and it will last the life of the home with proper maintenance, much like many of the materials being used in this home-in-the-making. Copper gutters were installed on this English cottage style home this past week and they look outstanding. I’ve got a few images here to get a closer look at the hand-cast copper hangers and the half-round seamless copper gutter system. Check it out! A look inside of an exclusive neighborhood called The Retreat, located next to Kennesaw Mountain National Battlefield Park in Marietta, GA.
Rondel glass is another form of stained glass that is an attractive alternative to windows throughout the home that are visual focal points. If you’ve never considered rondell glass before, I urge you to consider this type of window for your new home. This English cottage-style home offers several examples of rondel glass windows that offer unusual views of the surrounding outdoors. 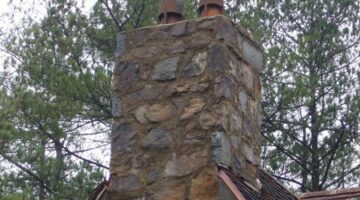 This article deals with a somewhat unique fireplace and chimney system that has been installed in this English cottage-style home located at Kennesaw Mountain. The modular-style system must be professionally installed by experienced installers. The results are a truly unique, safe, reliable and efficient fireplace that should last the life of your home. If you’ve ever wanted to get a front row seat to see the quality of craftsmanship that goes into building a ‘full blown’ English cottage style home, opportunity is knocking loud and clear.